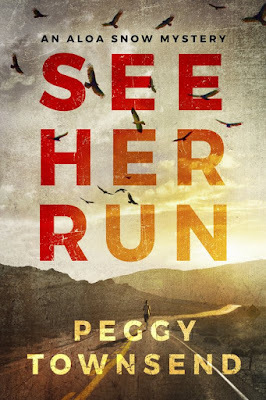 Brooklyn Digest: Books: "See Her Run: An Aloa Snow Mystery"
Peggy Townsend is an award-winning journalist whose stories have appeared in newspapers around the country. She has chased a serial killer through a graveyard at midnight and panhandled with street kids. Townsend takes what she has learned as a writer and put it into her debut novel, See Her Run: An Aloa Snow Mystery, a fast-paced thriller with a big heart. Aloa Snow was, at one time, a highly respected reporter for the Los Angeles Times, and her life is falling apart due to a professional mistake that not only lost her the job she dreamed of, but blackballed by the entire industry. Snow is depressed, in debt, and battling the ghosts of an eating disorder that never really left her. But, just as she is losing hope, she gets one more shot to prove she has what it takes to be an investigative journalist. When the dehydrated and sun-bleached body of Hayley Poole, a promising young athlete, is recovered in the Nevada desert, authorities call it a suicide because there is no evidence of foul play. It would seem like Hayley ran herself to death, but Aloa discovers that Hayley's boyfriend died in a similar accident only months before. Soon after, it becomes clear that Hayley is pushed to the limit by someone who never wanted her to recover. See Her Run is set against the backdrop of San Francisco, replete with seedy dive bars, scorched running trails, and isolated corporate mega-offices. With her investigative instincts kicking in, Aloa begins looking at the life Hayley and her boyfriend shared. Both of them were adventure athletes at the top of their game, pushing each other to run faster, longer, and in harsher environments. The power couple was gaining popularity, with Hayley about to be the subject of a documentary. Townsend writes of how Aloa approached the investigation, "Aloa believed cops his behind impersonal words in their reports in order to blunt the horrible things they saw every day. : 'Decedent' for the four-year-old girl who'd been starved to death, 'Reporting Party' for the blind widower whose bank account had been emptied by a once-trusted helper, 'Domestic Violence' when a young woman's eye socket was shattered by her husband's fist. "It had been her job as a journalist to uncloak those words, to lay bare the ugliness. She took a breath and began to read the reports Michael had given her. "In this case, the decedent was a twenty-five-year-old woman by the name of Hayley Poole. She was five foot five, 140 pounds,with brown hair and a small scar above her right eyebrow. On Friday, July 14, Hayley had gone with friends to a place called Jeremiah Valley in a remote section of the Nevada desert for a camping/bouldering weekend. She had left the campout in her Toyota pickup around 5:00 a.m. on Sunday after a confrontation with two locals who'd arrived with guns and accused the group of trespassing. "Hayley had reportedly yelled 'nature is free' at the two men, causing her friends to hustle her into the truck. Everyone scattered into their cars and left, including the gunmen. A friend reported Hayley missing after she failed to show up for an appointment later that evening. "Searchers found the young woman's abandoned vehicle on a dirt track forty-six hours after the report. Her body was recovered a full day later. It was more than twenty miles from any road. "The medical examiner's report listed more than one hundred cuts on Hayley's feet and legs, along with deep wounds on her face, the inside of her left thigh, and the soft part of her belly. One of her eyes was missing from its socket, and flies had already begun feeding on her cracked lips. The examiner estimated the girl had been dead for seventy-eight hours when her body was found. "Cause of death, he concluded, was severe heatstroke, brought on by 112-degree heat, a dry westerly wind, and drug and alcohol use. The wounds on the victim's body, excluding the cuts on her feet and legs, were the work of postmortem predators, although he was not sure about the missing eye. "Aloa flipped through the documents on the toxicology report. Hayley's blood work revealed low levels of potassium and sodium, along with traces of lysergic acid diethylamide, or LSD. "She read on to discover that Hayley has been going through a rough patch before her death. Her longtime boyfriend had died on a climbing expedition three months earlier, and because of a shin injury, a documentary being made about her exploits as an adventure runner appeared to be in jeopardy. She'd lost an important sponsor and was living in her truck." Aloa finds out that the important sponsor that they were working on endorsement deals with was the influential fitness company, RedHawk Nutritionals. The more Aloa gets closer to the truth and starts asking questions that powerful people do not want answered, she becomes targeted herself. The case turns into a matter of life or death for Aloa, and Hayley won't be the last one to suffer. Someone very powerful forced Hayley to run for her life, and now Aloa will have to do the same thing. This story is about one woman's unwavering strength as she goes up against forces that seem insurmountable, some of which are in her own head. It is hard not to root for this heroine, Aloa, and her unlikely crew of helpful friends as she unravels a web of violence, exploitation, and a cover-up with sickening consequences. This is a gripping read, a tale of an idealistic reporter that people can relate to in this day and age, and is quite thrilling from beginning to end.